clarkwardorange has no other items for sale. Super product at a great price! Thank you! Item was exactly as described and shipped promptly- a STELLAR SELLER! Thank you! A+ Excellent Ebayer. Would buy from again. 73 Magazine was a very informational publication with many articles and construction projects by Mr, Green and others. Good to have History copies. 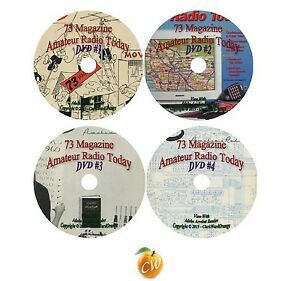 A lot of content on these DVD disks so have Not looked at very many issues of 73 magazine on these DVD's. However, from what I have seen/observed of the issues we visualized the quality is good and the DVD's make a good History of the 73 Magazine which I subscribed to for years being an electronics engineer and Amateur Radio operator. A great value and excellent quality. Very nice set of CDs from what was undoubtedly the best ham radio magazine of all time. Super bargain! Lots of great info. The disks replaced my very space - consuming 73 magazine collection. The DVD's contain all (I think) 73 magazines published. Therefore a treasure trove of useful projects and ideas. this is good for for Amateur radio orp.